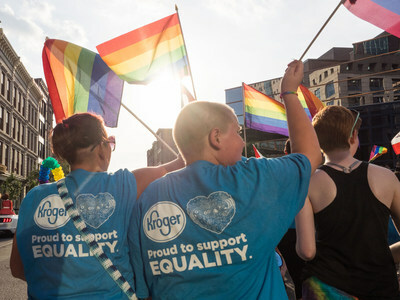 CINCINNATI, March 28, 2019 /PRNewswire/ -- The Kroger Co. (NYSE: KR) today announced it earned a perfect score on the 2019 Corporate Equality Index, the Human Rights Campaign Foundation's national benchmarking tool for corporate policies and practices supporting lesbian, gay, bisexual, transgender and queer employees. The annual survey assesses non-discrimination workplace protections, domestic partner benefits, transgender-inclusive health care, competency programs and public engagement with the LGBTQ community. Kroger met or exceeded all Corporate Equality Index criteria, resulting in a perfect score of 100 and designation as a Best Place to Work for LGBTQ Equality. "This is a very proud moment for Kroger. We have worked to create a more inclusive work environment where every associate can be their best self every day and this recognition reinforces our commitment," said Tim Massa, Kroger's senior vice president of human resources and chief people officer. "It is also a testament to the thoughtful insight provided by our LGBTQ associates and allies, who have shown us what we do well and where we can improve." "Our steps to create a more uplifting workplace and culture for all associates will continue," added Massa. "There is great power in recognizing our unconscious biases, learning from each other and listening to understand, so we can best support the people who matter most: our associates." The Human Rights Campaign is the nation's largest LGBTQ civil rights organization that envisions a world where LGBTQ people are ensured equality at home, work and in every community.